Figs. 1 and 2 show illustrations of V2V and V2I . Fig. 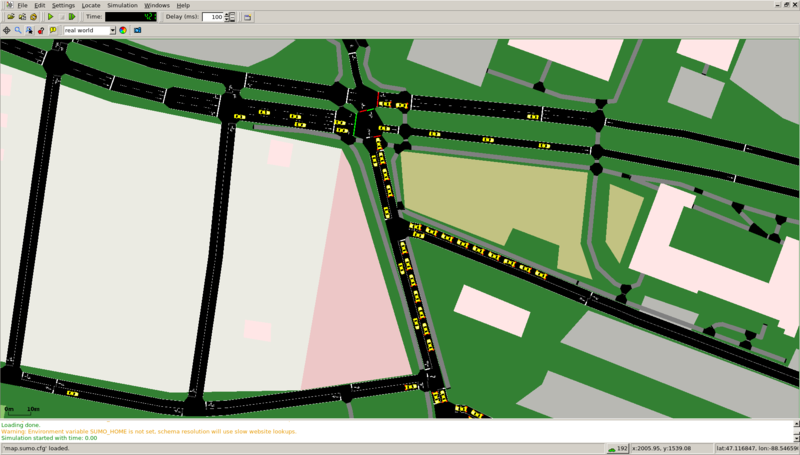 3 shows the map of the main campus road on SUMO (Simulation of Urban Mobility)2. The focus of our research group is on hybrid communication systems and signal processing. Our current research on Vehicular Communications and Networking include Intra-Vehicle Communications (CAN, LIN, MOST, FlexRay), Inter-Vehicle Communications (V2V, V2I, V2X), and the interface between the two domains. V2V stands for vehicle-to-vehicle communication, while V2I stands for vehicle-to-infrastructure communication; V2V and V2I are also referred as V2X (Vehicle to Anything), including bicycles, cellphone, etc. We develop V2X solutions and test them using a start-of-art simulation platform and a vehicular testbed (currently under further development). 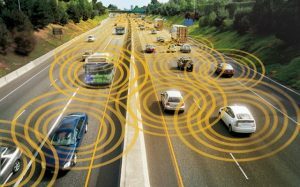 Vehicular Networking has emerged as one of the most important technologies to enable a variety of applications in the areas of safety, traffic efficient and eco-friendly transportation, and infotainment. The technology is expected to reduce vehicle crashes by 80%, to provide better traffic and travel condition information, and to provide convenience services such as e-parking and toll payment. Real-time data information on traffic conditions will allow drivers to eliminate unnecessary stop and vehicle can reach optimal fuel-efficiency. 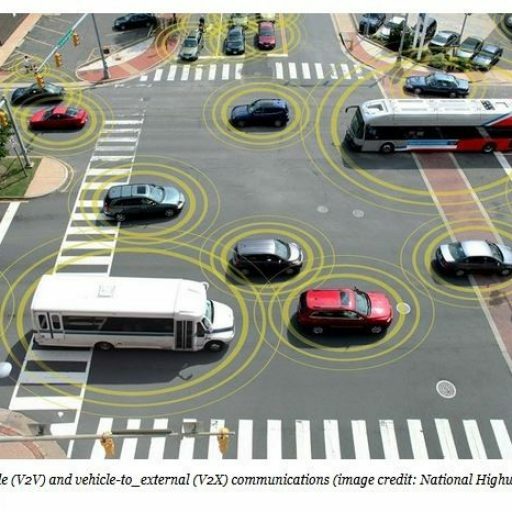 In December 2016 the National Highway Traffic Safety Administration (NHTSA) published the notice of proposed rulemaking for the Federal Motor Vehicle Safety Standard (FMVSS) 150, which, if passed, will require that all manufacturers install Dedicated Short Range Communication (DSRC) modules on new vehicles starting in 2020. It is predicted that by 2025 more than 20 million vehicles will be sold in North America with vehicle communication based on DSRC and nearly 70 million globally. DSRC is the key technology chosen by the NHTSA for the deployment of V2V and V2I communication. Even though DSRC has been in development and testing for over one decade, there still many DSRC challenges to be addressed before its use in large scale. Therefore, there are many opportunities for research and development in the area of Vehicular Communications and Networking. The DSRC stack of protocols includes three main categories of standards: IEEE 802.11p, IEEE 1609 series, and SAE J2735/J2945.1. The IEEE 802.11p is also known as Wireless Access in Vehicular Environment (WAVE), and is a MAC and PHY level standard. The IEEE 1609 standards are for security, network services, and Multi-channel operation. The third standard, developed by the Society of Automotive Engineers (SAE), SAE J2735 is a message set dictionary. Our research focused primarily on the Network and Transport Layers (IEEE1609.3) and the Physical Layer (IEEE 802.11p).